Welcome to the Predator Ecology Lab! Since 2008, as part of the Wildlife Science Program in the University of Washington's School of Environmental and Forest Sciences, we have sought a better understanding of how predators influence their surroundings by interacting with one another and their prey. Much of our work also seeks solutions to the challenges of large carnivore conservation and management in a changing world. April 2, 2019: Today, Apryle Craig presented a talk titled, "Reality TV: Using technology to capture the true nature of nature" in Bellevue for the Mountaineers Club. She discussed a few emerging wildlife research tools including acoustic sampling, drones, and her research that uses animal-borne video collars and accelerometers to understand interactions between recolonizing wolves and deer in Washington. March 27, 2019: Follow this link for a new Methow Valley News story about Lauren Satterfield and her cougar research, which is part of the Washington Predator-Prey Project. Great story, Lauren! March 27, 2019: Shout out to Carolyn Shores, featured this morning in a UW Today story titled, "New tool maps a key food source for grizzly bears: huckleberries"! In 2017, Carolyn spent the summer working as part of a USGS project mapping huckleberry access to grizzlies in Montana with funding from the NSF GRFP GRIP (Graduate Research Internship Program). Nice work, Carolyn! March 21, 2019: Good news is just pouring in! Apryle Craig has been awarded a grant from the 2019 Integral Environmental Big Data Research Fund. Titled, "Behaviorally-mediated trophic cascades: Interactions among wolves, deer, and plants in north central Washington, U.S.A.", the grant will give her the resources to leverage and combine accelerometer and video camera collar data to better understand deer behavioral responses to recolonizing wolves. Well done, Apryle! March 20, 2019: We are pleased to announce that Clint Robins has a new open access paper out today in Ecosphere based on is Masters research on cougar foraging ecology along western Washington's wildland-urban gradient. Way to go, Clint! March 19, 2019: Clint Robins is featured today in a Crosscut article titled, "He finds humans 'too unpredictable' - so he studies cougars for a living". Super story, Clint! March 15, 2019: Congratulations to Shannon Kachel, who today attained the rank of PhD candidate after passing the general exam! Shannon will now enter the final phase of his dissertation research, which addresses interactions between snow leopards, wolves, and shared prey in the high mountains of Central Asia. February 27, 2019: Just up today, please click here for a new University of Washington story profiling Dr. Justin Dellinger's PhD research on divergent mule and white-tailed deer responses to recolonizing gray wolves in eastern WA. Many thanks to Michelle Ma for the coverage! The photo to the right was snapped by one of the motion-activated game cameras we used to monitor wolf activity over the course of our investigation and is displayed with permission from the Confederated Colville Tribes Fish and Wildlife Department. February 23, 2019: Today in Omak, WA, Lauren Satterfield continued her presentation binge with a talk titled, "Wolves, Cougars, and Deer in Washington" to the Okanogan Trails Chapter of the Mule Deer Foundation. The talk was part of a Mule Deer Summit. Many thanks to longtime PEL collaborator and friend Matt Marsh, of the Forest Service, for inviting Lauren to participate, and well done Lauren! February 22, 2019: Today, Clint Robins was invited to return to his alma mater, Williams College, to present a poster titled, "Investigating the effects of urbanization on cougar foraging ecology along the wildland-urban gradient of western Washington" as part of a Class of 1960 Scholars Event held during the annual Williams Biology Alumni Reunion. Thank you, Clint, for representing us with such a great poster! February 21, 2019: Today, PEL lab member Shannon Kachel took a break from preparing for his upcoming General Exam to give a public talk titled, "Ghost of the mountains: predator-prey ecology and conservation in the high mountains of Central Asia" at the Mountaineers on his research into snow leopard ecology and conservation. Thanks, Shannon! January 31, 2019: As part of a collaborative seminar series between the Predator Ecology Lab and the Seattle Mountaineers Club, Clint Robins delivered a talk today titled, "Cougars (Puma concolor) in a modern world: the nuances of risk, tolerance, and management." The evening focused on discussions regarding the recent cougar-caused fatalities in Washington and Oregon, as well as portrayals of wildlife in news media. The presentation is the first of 3 talks provided by the Predator Ecology Lab at the Mountaineers Club in Seattle. Great job, Clint! January 31, 2019: Congratulations to Lauren Satterfield, recipient of a prestigious Early Career Grant from the National Geographic Society titled, "Tipping the scales: do humans increase predator hunting success?"! This award will allow Lauren to equip cougars with GPS collars sporting accelerometers capable of identifying predatory behavior (bursts of movement), which when coupled with location data and on-the-ground investigation can be used to identify successful and unsuccessful attacks. Excitingly, it comes on the heels of a Royalty Research Fund grant from the University of Washington (to Lauren and PI Wirsing), which will also support deployment of GPS collars with accelerometers on cougars. The figure to the right is from Wilmers et al. (2017) Ecosphere. January 24, 2019: Lily van Eeden, who is visiting our lab from Australia, just published a paper on the human dimensions of wildlife showing that the social group(s) you identify with shape(s) your attitudes towards wildlife management, but that the public in general supports nonlethal management and restoring top predators over human-imposed culling of herbivores and mesopredators. Out now in Biological Conservation. November 30, 2018: Congratulations to Shannon Kachel, who is co-author on a paper titled, "Responses of snow leopards, wolves and wild ungulates to livestock grazing in the Zorkul Strictly Protected Area, Tajikistan", just out today in PLoS One! November 15, 2018: Here in the PEL, we strive to maximize the reach of our research. To that end, Lauren Satterfield has truly distinguished herself of late. Namely, she has given no less than six public talks or workshops over the past couple of months. Lauren's audiences have included the Friends of the Little Pend Oreille National Wildlife Refuge, the Alderleaf Wilderness College, Seattle City Light, and the Methow Conservancy. For more details, please see the Washington Predator-Prey Project website. Thank you, Lauren, for helping to broaden our impacts! importance of people" as part of a special symposium titled, "Challenges of Balancing Stakeholder Engagement and Scientific Decision-Making to Inform Wildlife Policy" at the TWS conference and then again at the International Wolf Symposium. She also presented a poster titled, "Social identity and perception of animal "nativeness" shape public attitudes towards wildlife management" at the former meeting. Hearty congratulations to all of the presenters! September 14, 2018: Today, Clint Robins became the latest PEL graduate student to pass the qualifying exam. Congratulations, Clint, and we hope that you were able to celebrate over the weekend! July 10, 2018: We are pleased to announce the first publication from the Washington Wolf Project, titled "Impacts of recolonizing gray wolves (Canis lupus) on survival and mortality in two sympatric ungulates". Kudos to PEL alumnus Dr. Justin Dellinger as the lead, as well as Carolyn Shores as a co-author! The paper is just out in the latest issue of the Canadian Journal of Zoology. More to come! June 14, 2018: We have a new paper out in Conservation Letters, led by PEL collaborator Dan Thornton (of Washington State University), titled, "Asymmetric cross-border protection of peripheral transboundary species". Made possible by a Catalyzing New International Collaborations (CNIC) grant from the National Science Foundation, the paper highlights the inadequate conservation attention that is currently being given to North American species (mammals, birds, and herpetofauna) whose ranges span the borders of USA-Canada or USA-Mexico. Thanks, Dan, for inviting us to be a part of this exciting effort, and to all of the co-authors who made the workshop on which the paper is based such fun! June 5, 2018: Close on Apryle's heels, Lauren Satterfield has now successfully defended her dissertation proposal and achieved the rank of PhD Candidate. Santé, Lauren! May 29, 2018: Hearty congratulations to Apryle Craig, who today successfully defended her dissertation proposal and is now a PhD candidate! Thank you, Apryle, for delivering an extremely clear and well organized talk, and a special nod as well to Shannon Kachel for tuning in from half way 'round the world. May 1, 2018: Apryle Craig and I are grateful to the Confederated Colville Tribes for inviting us to give updates on our wolf research as part of the Natural Resources Committee Meeting today. April 20, 2018: Thank you to Bradley Strickland and the Florida International University Marine Sciences graduate students for inviting me (AW) to give a talk titled, "Escape behavior predicts divergent responses by prey in both marine and terrestrial ecosystems" as part of their seminar series. Felt great to be back on campus after nearly 10 years! 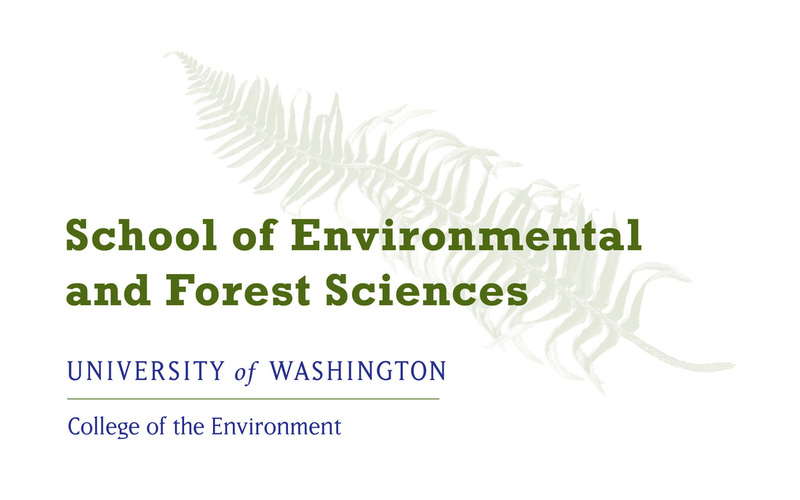 March 19, 2018: Hannah Booth ​our NSF REU student received the University of Washington's prestigious Mary Gates Research Scholarship. As part of this scholarship, she will be presenting her research on plant responses to fire and top-town trophic cascades at the annual Undergraduate Research Symposium in May. Congratulations, Hannah! March 15, 2018: Thanks to Lauren Satterfield for letting Lily Van Eeden and I tour her study area in the Methow Valley by snow machine! The weather sure helped make for a memorable trip, and we even got to visit a really neat cougar kill site.